The Image Editor gives possibility to edit current image. For that select the tab Edit in Image Area. The Image Editor contains the Toolbox and Color Palette. To use any drawing tool of the Toolbox click on it by the left mouse button. The box with few variantes of this drawing tool is displayed in the bottom part of the Toolbox (if this tool has variants). If you draw by the left mouse button then drawing tools use foreground color from Color Palette located at the bottom of the main window. If you draw by the right mouse button then drawing tools use background color as an active color. To select any palette color in the current editing image directly use toolbox button of Image Editor. you can use operations: Undo and Redo in process of frame editing (select menu items Edit / Undo and Edit / Redo or click toolbar buttons and of Standard Toolbar). Color palette is an array of colors. Each pixel of image reffers to color by index in color palette. Images in GIF- files can contain up to 256 colors. Therefore color palettes of multicoloured images will be transformed to 256 colors. See: add image to GIF; paste image from clipboard, Image Collections, Button Creator; frame operation merge; animation scripts. There are two kinds of palettes: global and local. Local palette defines colors for individual image inside GIF- file. It demands some extra memory in GIF- file to be stored. Local palette may be absent, and global palette is used for that case. When you add new image it may use local or global palette. It depends on setting of combobox Palette on tab New in dialog File / Preferences. You can delete (create) local palette using menu items Image / Attributes / Delete (Create) Local Palette. You also may create global palette in optimization dialog: Move colors from local palettes to global palette. 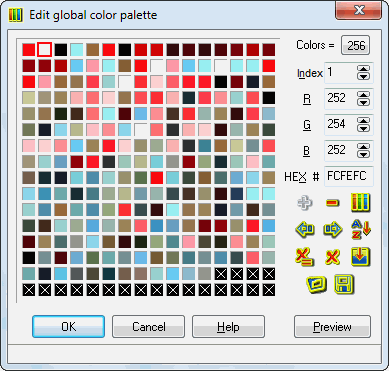 You can edit global and local color palettes in menu items Global / Global Palette and Image / Attributes / Local Palette or by means of Attribute Toolbar. Mouse double-click on editor color palette invokes edit color palette dialog too. You can change selected color entry (in red rectangle) by means of spinedits R, G, B or field HEX # or button . Also you can add ( ) or remove ( ) color index; move current color by mouse dragging or by buttons , ; sort palette entries ( ) by usage or R, G, B values; delete extra palette entries with equal colors ( ) or all unused ( ); redefine color entries in form of gradient fill ; load palette from file with extension .p ( ) and save it ( ).